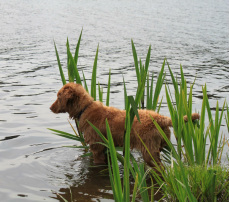 Rina is a very fun puppy who has a great love for water and field work. She is AKC pointed from the puppy classes and BW and BOS. We are looking forward to future litters with Rina as our foundation. Rina completed her AKC Championship and needs only one point in Canada for her CKC Championship. Rina has always been showed by Sarah and Diane. Rina is now enjoying a retirement lifestyle. She still loves a good romp after bumpers or balls, playing with the 2 legged grand-kids and the couch after the sun goes down.